Kurt Russell as Han Solo in Star Wars . No, this isn't a Kevin Spacey impression or a prank. 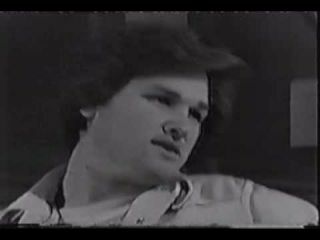 Kurt Russell auditioned for the original role of Han Solo, and YouTube has the tape. Surprisingly, it's not bad. He's actually pretty good. Obviously, Harrison Ford put a lot of himself into the character, so it's hard to imagine Solo as anyone else. At the same time, Russell has a roguish style that works as well. What do you think of Kurt Russell's performance? Did we dodge a bullet getting Harrison Ford or could Russell have pulled it off? I just cannot fathom Kurt Russell as Han Solo because Harrison Ford is so ingrained in my mind. I'm going to go with "dodged a bullet".